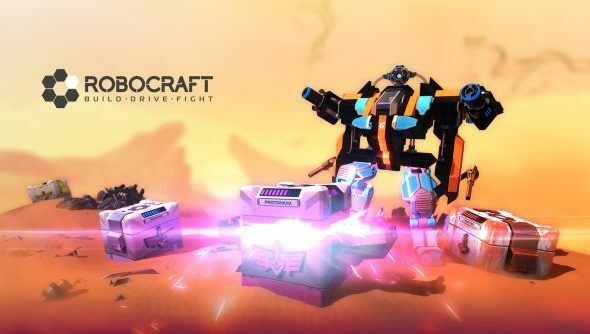 Robocraft’s been pottering about in Early Access for a couple of years now, taking the basic PvP and F2P setup of World of Tanks and porting it to a sci-fi world of Lego-block vehicles you custom design yourself. They can float, they can walk, most of all they can blow each other up with high-powered laser cannons, plasma guns and mixed projectiles. The latest update, Epic Loot, is improving the rewards for that with crates that drop random assortments of weapons and other items to strap to your deathmobile. It’s coming out later today. Looking for something new? Here’s the best free PC games you can play right this moment. The loot system. This allows for the purchase or earning of various qualities of crates, which contain various qualities of items. You get them for doing well in matches, for logging in, or they can be grabbed in the store in bundles of 12 for £3.99 / $4.99. To support this, the tech tree has been removed and all weapons are now usable at all levels. There’s some scaling tech in place, but the folks over at Freejam have tried to make everything viable as much as possible. Naturally with this sort of system, there’s also a recycling method in place for you to get rid of stuff you don’t want and turn it into things you do. The new currency is Robits and can be used on any weapons, blocks or traversal methods you might want, as well as being a reward for uploading vehicle designs to the community store. There’s also a balance pass in the patch, specifically targeting armour. In addition, Freejam are pitching this as one of the last updates as the game moves towards final release. The progression system and massive overhaul of weapons are now in a near-final state, and they’re hoping to enter beta soon and leave Early Access before the end of the year. It’s going live later today, and there’s some more info available over on the Robocraft site.